It’s pretty often there’s something rotten in Alabama politics. Whether it’s a corrupt politician, a broken budget deal or something else entirely, Alabamians usually aren’t surprised by Goat Hill antics. 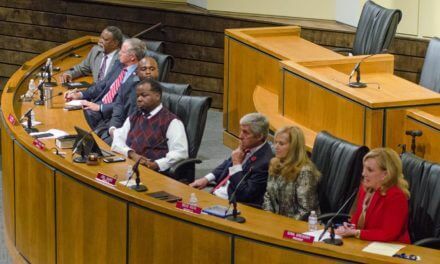 Occasionally, though, everything in state politics goes rotten all at once, and the putrid smell of bad public policy wafts all the way from Huntsville to Mobile, turning the stomachs of even the more seasoned among us. This is one of those occasions. In Montgomery, lawmakers and bureaucrats are preparing the state for President Donald Trump’s devastating budget: stuffing money under the state’s mattress, preparing to cut costs and services, and raising whatever taxes and fees look the most profitable at the moment. And in federal court here in the Heart of Dixie, Alabama is finally dealing with a state law that allowed a sheriff to feed prisoners only two corn dogs a day while pocketing around $200,000 in inmate food funding. Both issues are rotten eggs for our state, and it’s time we faced up to the facts. The first rotten egg in Alabama was imported all the way from Washington, D.C. Trump’s proposed budget, if passed, would financially cripple, if not kill, various programs in the state. Trump’s so-called “America First” budget significantly increases defense spending while slashing funding in almost every other area. Here in Alabama, its effects could be widespread. Last week, for example, Jim Byard, the head of the Alabama Department of Economic and Community Affairs, laid out some of the budget’s likely impacts. Byard outlined seven different state programs — including those aimed at providing low-income housing, alleviating poverty and developing local communities — that would see drastic cuts under the proposed plan. The Community Development Block Grant, for example, a program Mobile and other cities have used to secure funding for various projects, would be cut by $3 billion, according to the president’s proposal. Another effect of the budget will likely be on the Medicaid program, which provides health care for low-income citizens. The Trump administration is expected to put an individual cap on the cost of services provided, a move that would result in slashed funding to states, which must put up their own matching funds to keep the program afloat. So how do state policymakers plan on dealing with this budget bungle? Taxes, fees and mattress stuffing. State government bureaucrats and lawmakers alike are setting their sights on raising taxes and fees in ways that they can defend. Instead of raising the property or income taxes — which are still at Great Depression levels and opposed by powerful special interests such as the timber lobby — the state is set on raising taxes and fees on other products, such as a fee on Netflix and other streaming services and a possible increased 5 percent markup on liquor distributed by the state. Then, when it comes to the potential gap in Medicaid funding due to the Trump cuts, the state has stuffed its mattress. Instead of providing state employees with a cost-of-living increase they’ve been promised again and again, this year’s general fund budget sets aside close to $100 million for Medicaid next fiscal year — a move aimed wholly at protecting the state from Trump’s deep cuts. Trump’s fiscal fiasco isn’t the only rotten egg stinking up the Yellowhammer State, though. In Alabama, a state law passed in 1939 allows sheriffs to personally pocket whatever money is left from the feeding of inmates as a supplement to their own salary. This antiquated law — and its lurid legacy — have risen to the surface again after Morgan County Sheriff Ana Franklin admittedly loaned $150,000 in inmate food funds to a corrupt used-car dealership that later went bankrupt. Although Franklin’s office denied an open records request for documentation involving the inmate food fund made by the Decatur Daily, claiming the fund is for “Franklin’s private use,” a previous audit by the state shows a deficit in the fund of tens of thousands of dollars, at a time when Franklin’s annual salary is already $68,000 — more than double the median family income in Alabama. Now, Franklin may be in legal hot water over the issue, but only because her predecessor was even greedier than she. Before Franklin took office, then-Sheriff Greg Bartlett was sued and ordered by a federal court to stop spending prisoner food money personally — despite Alabama law — because inmates under his charge were malnourished. Even after the order, Bartlett used backroom deals to skim a profit off the fund. Bartlett testified in federal court that he, for example, got a deal on a truckload of corn dogs, which he split with another sheriff. Inmates testified that for weeks, they ate only two corn dogs a day, while Bartlett skimmed close to $200,000 to line his own pockets. In 2009, though, U.W. Clemon, a now-retired federal district judge here in Alabama, realized Bartlett was still taking money from the fund. After hearing testimony from underweight prisoners, Clemon ordered Bartlett placed in jail until he had a better plan to adequately feed the prisoners under his care. Now, closing in on a decade later, Bartlett’s successor — Sheriff Franklin, admitted corrupt car lot financier — is arguing she’s not subject to the order against Bartlett preventing the pocketing of money, despite the fact that “public officials are automatically substituted as parties to any case in which their predecessors in office were sued in their official capacity,” according to the Federal Rules of Civil Procedure. To solve this problem and others like it across the state, the law allowing this practice needs to be changed, although it may not be easy. Treadaway was run over by the Sheriffs’ Association and other law enforcement agencies, which see any change in the law as, essentially, a salary cut. But Treadaway says while the opposition to changing the law is fierce, it’s clear what is going on is just plain wrong. Alabama’s law on inmate food funding should be changed, but until it is, some sheriffs have made it clear: Let them eat corn dogs. Lee Hedgepeth writes Montgomery Minute, our state politics column. Lee graduates in May with a B.A. in political science from the University of South Alabama, where he served as a 2016 Summer Undergraduate Research Fellow. He has previously worked for various statewide political news organizations, including Inside Alabama Politics and Alabama Political Reporter, for which he covered the state legislature full time in 2013. In addition to completing his degree this year, Lee also works part time as a consultant for USA’s Writing Center, where he helps students, faculty, and alumni hone their composition skills. One fish, two fish, drink red wine with fish!